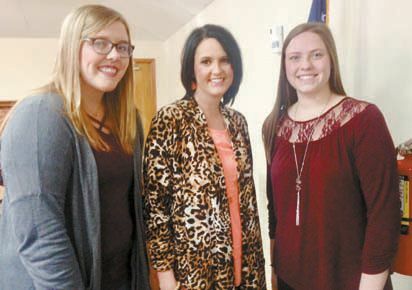 HONORED: Pictured are CHS January Student of the Month Claire Kerr, CHS Principal Whitney Moore and CHS December Student of the Month Molly Malson. By Pat VerSteeg — This past Tuesday the December and January CHS Students of the Month were honored at Kiwanis/Senior Citizens. CHS Principal Whitney Moore presented Molly Malson, December Student of the Month, and Claire Kerr, January Student of the Month. “These two outstanding students represent the highest ideals of our CHS Students and I’m very proud to introduce them both to you.